A journey into Ohioans’ economic lives with bracing implications for American politics. Winner of the Independent Book Publisher Award, Bronze Medal in Current Events, 2017. For some, the Great Recession that began in 2007 was a traumatic setback; for others, it was just another dip in a long descent from comfort and security. America is changing in profound ways, but we rarely hear the voices of regular people living the transformation. As Ohio Goes is a journey through cities, suburbs, and remote rural towns in this quintessential American state. Sitting together at dining room tables, walking through rows of planted fields, and swinging back beers at pubs, you’ll meet individuals you won’t soon forget. People like Bill, whose handicap did not push him to take disability payments until his layoff, and Rhonda, a working mother embarrassed to feed her son using food stamps. There are the young soldier who shows us his scars from deployment to Iraq but who remains in the Army to make ends meet, and the Amish man whose business loss during the downturn induced him to leave his family and the church. Together their stories personify today’s timeliest issues, which Rana B. Khoury navigates in informative and accessible terms. 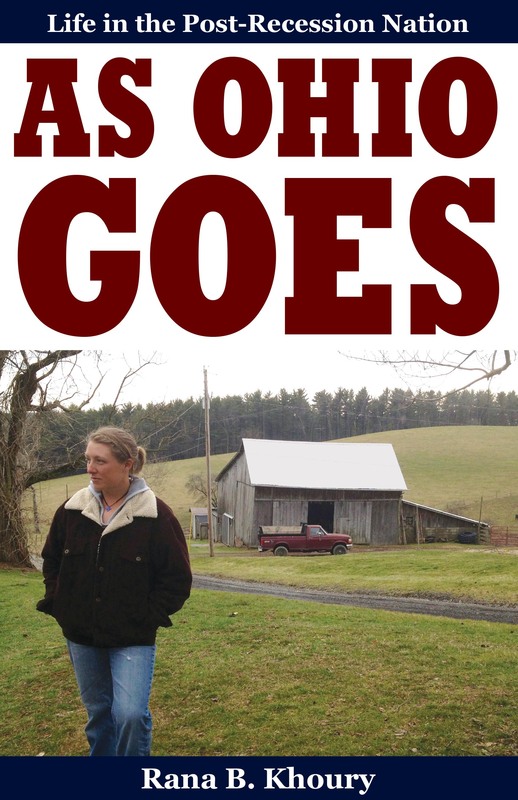 From student debt and health care costs to female breadwinners and hydraulic fracturing, As Ohio Goes situates each story in a context that relates it to wider trends in Ohio and across the United States. Where economic experts deal in the abstract, Khoury pumps life into otherwise cold facts and figures, putting a human face on economic issues. If the old adage “as Ohio goes, so goes the nation” is right, then these stories should tell us where the nation is headed. Although Ohio is a swing state, Khoury insists that blue and red do not capture the character of the place she calls home. Another reality demands attention: economic inequality has reached historic levels, and there is no indication that the trend will slow or reverse. The growing income gap threatens democratic representation, equal opportunity, and even the American Dream itself. The people in this book display remarkable adaptability, resilience, and love, despite their predicaments, yet the country’s course is the sum of individual fates. Where are Ohio and the nation going?